An orthotic is a supportive device which is placed inside footwear, to change the mechanical function of the foot. It works dynamically during weight-bearing activities like walking, running, and standing. Ideally, it should provide full, custom and corrected arch contact so that the foot works in a biomechanically correct way. To date, only Sole Supports™ manufactures full arch contact orthotics. The reason is simple: they are more difficult to make because they must actually change the way your foot works and be comfortable at the same time. Other orthotics are either just cushions or give a more generic, insufficient arch support not customized to your foot. They may feel fine but, by failing to actually correct faulty foot mechanics, will not prevent the usual painful deformities or syndromes. If you would like to find out if custom orthotics would help you, contact our office today. What are faulty foot mechanics? The foot is designed to un-lock, or pronate, when it hits the ground for shock absorption and to conform to variable terrain. Then it must re-stiffen (lock), or supinate, for efficient leverage as we propel ourselves forward onto the next step. When either of these phases are excessive or out-of-synch the foot has faulty mechanical function. Ninety percent or more of us over-pronate, that is, our arches flatten out too much (flat feet) and do not re-stiffen enough for efficient propulsion. About four percent of us are over-supinators with high, rigid arch structure. Then the problem is poor shock absorption and weight bearing pressure concentrated in a few spots. What kinds of problems result from faulty foot mechanics? Pain and deformity can arise in the feet such as bunions, plantar fasciitis, corns, and hammertoes. Because foot function affects the entire chain of bones leading to the spine, pain and dysfunction in the knee, hip and lower back often result as well. In all there are over thirty common diagnoses related to poor foot function. Can problems be prevented or corrected with the use of Sole Supports custom orthotics? Yes. If the problem is caught early enough, pain and deformity can often be prevented. Regular use of these unique orthotics can often reverse deformity development or, at least, prevent surgery. How? Because when you restore normal function you give your body what it needs to heal itself. Your other necessary treatments or therapies are more effective and last longer too. That will depend on how advanced the condition is, flexibility of the deformity if one is present, age and general health. For most people, significant relief is experienced within weeks of regular use; at most, it may take a few months. Why do we use Sole Supports? With all the different products advertised for relief of foot pain and deformities, picking the right one for your needs can be confusing and difficult. The truth is there are quite a few people that suffer from foot ailments who are anxiously looking for a solution – some willing to try anything. It is also sadly true that the vast majority of products currently sold as foot pain solutions are useless, especially in regards to eliminating the problem long-term. So how do you find what is right and effective for you? If you are like the majority of people with some degree of arch loss, either from birth or over time, there are some critical facts you need to know before you can make an informed decision. All of the common foot problems, such as bunions, plantar fascitis, metatarsalgia, calluses and corns, etc. are usually caused by the lack of enough arch in the foot when we are standing, walking and running. There are a number of reasons why most of us have some degree of flat feet, but mostly it comes down to body weight, gravity, and concrete. The first two are constantly flattening the foot down against the hard surfaces we live on. The ligaments that support the bones of the foot get stretched out and our arches drop. Typical custom orthotics are made based on some unproven assumptions about how to control the foot that seem to defy real world engineering and the laws of physics. These are blindly followed simply because they are “industry standard”, not because they have been proven effective. In fact, the majority of medical studies done on the effectiveness of standard custom orthotics compared with off-the-shelf cushions or other treatments have demonstrated that they are either no better or worse! Standard custom orthotics use wedges under the heel and forefoot to try to correct foot functions – because that is traditional teaching. Usually the arches in these orthotics are minimal, partly because manufacturers are concerned that the casts they receive from practitioners are unreliable, and partly because the flatter the orthotic, the less chance the user will be uncomfortable. Because they avoid full and dynamic arch support, they cannot be effective in preventing arch collapse. So they end up merely being expensive. If you have flat feet, try standing on a small wedge and see if it holds your arch up. The real question , then, is what is the best way to hold the arches up, correct the way our feet work, and fight body weight, gravity, and concrete? That is how we can appreciate the difference between Sole Supports and typical custom orthotics. Sole Supports were designed like an engineer would design the best way to build a bridge, looking at the real forces involved and how best to manage them. When Dr. Edward Glaser designed Sole Supports, he discovered three critical things that an orthotic has to have in order to be effective. First, orthotics must capture the properly corrected position of the foot: as high an arch as the foot can make with heel and forefoot flat on the ground. Second, the orthotic must make full contact with the entire foot in this position, especially with the corrected arch position, in order to have the mechanical power and efficiency to control the foot. Third, the orthotic must be rigid enough to maintain this corrected position against the person’s weight and gravity and yet be flexible enough to be comfortable upon impact with a typical concrete floor. To accomplish these three main goals, he experimented with new, reliable casting techniques to get the right custom foot mold and with materials that could offer the right blend of rigidity and flexibility for every individual foot. He now spends most of his time training healthcare practitioners, most of whom have had traditional orthotic training, the how and why of Sole Supports. A small percentage of people have the opposite problem: their arches are too high and rigid due to congenitally tight bone structure. Their feet are very poor shock absorbers and all the force of body weight and gravity gets concentrated on a few points at the bottom of their feet. Dr. Glaser discovered that his full contact orthotic design was also quite effective for this foot type because it re-distributes foot pressure evenly across the entire sole of the foot. For the first time, people with this more unusual foot problem now have a custom orthotic solution. Hopefully, now you can understand that all orthotics are not alike. 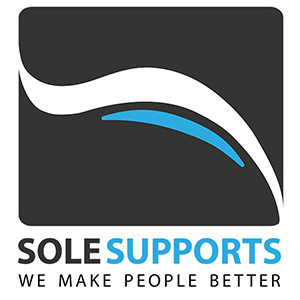 Sole Supports are proud to be setting a new and effective standard for foot relief that helps prevent as well as treat all the common foot and even lower leg conditions caused by poor foot function and we are proud to use only Sole Supports in our office!